BSD has partnered with Feel Free Kayaks and is pleased to offer their Atlantis 14, Atlantis 12, and the Moken 13 Angler Deluxe together with our Boss™ Batwing™, Twins™ or Classic Canoe sail rigs. Pair one of these kayaks with BSD’s sail rigs and you have a comfortable, durable sailing kayak with built-in foot peddle steering, bulkheaded storage both fore and aft and a day hatch. 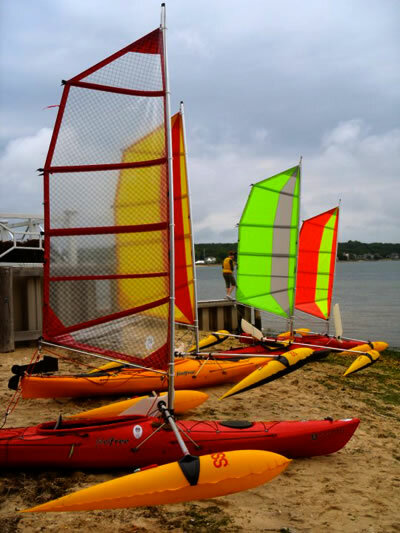 The BSD/Feel Free sailing kayak is a boat you can depend on for cruising, adventure kayak sailing and an easy boat for the novice kayak sailor to master for a fun day sail. (Note: Complete kayak/sail packages only - no sales of kayaks only through BSD). Choose your sail from one of our sails InStock and we’ll ship your boat in 10 days!